Eyeshadow looks great on the eyes but can be high maintenance. Here are 5 easy ways to make your eyeshadow stay on all day. These tricks are simple and they work. Trying countless eyeshadows can be expensive, prolong the wear of any eyeshadow with these tricks. Read my list of best long lasting high-end and low-end eyeshadow by visiting my post on Top 10 Best Long Lasting Eyeshadows That Stay On All Day . Below are ways that will make your shadow budge-proof. Create a clean base for your eyeshadow to adhere to. This means having a clean and moisturized skin. 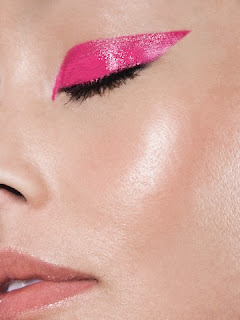 Also powder your eyelid area to absorb the excess oil before applying eyeshadow. Using an eyeshadow primer can not only prevent creasing and fading of the eyeshadow but also increase the intensity of the eyeshadow. My favourite high end primer is the Urban Decay Primer Potion and my favourite low end primer is the Elf eyeshadow primer for a fraction of the price. You can also substitute a primer with a good concealer. Another option is to use a cream eyeshadow base that has almost the same color as your eyeshadow. This allows the powder eyeshadow to adhere to the cream eyeshadow and also makes the eyeshadow appear highly pigmented. Using your eyeshadow wet will not only intensify the look but also prolong the wear of the eyeshadow. I like to spray the eyeshadow brush with a fine mist of water or contact lens solution and then dip the brush into the eyeshadow. Do not spray too much liquid or it will not only mess up the eyeshadow in the pan but also your eyeshadow look. Set your eyeshadow with mineral water, water or a makeup fix like MAC fix plus. This also gives a dewy finish to your skin. Yes this problem is my biggest one! Thanks for the tips....I will try them out. @anonymous, you are very welcome! Hope it works out for you.. I just stumbled across this article because I was searching for a more economical way to "prep" my eyeshadow and I always see people use MAC's fix plus but I just KNEW there was a better way! That contact solution method is genius! LOL. I have tons of the free sample bottles they give u from the eye doctor, so I'll use that. THANK YOU! Can't wait to try it. You are very welcome. Another good alternative is the elf eye primer which is only $1. Best of luck! does vaseline work the same?? I wouldn't recommend Vaseline because it can be quite oily and may cause the eyeshadow to crease more. Try concealer with powder on top. Yes, that may work too. Good luck! I have the elf primer and it only comes in one color, ivory. If you have tan/beig skin and are using a light eyeshadow color like gold or something, it's going to look like chalk.